In an effort to further WITH’s mission of promoting comprehensive and accessible healthcare for adults with developmental disabilities, we are developing partnerships in the area of digital health. One of those partnerships is with the USC Center for Body Computing (USC CBC), a digital health research and innovation center that is creating technology-driven healthcare solutions for a modern age. WITH and USC CBC have been working together for the past two years with the mutual mission of ensuring the perspectives of individuals with developmental disabilities are included as the digital health world advances. The Annual Conference is a great place to check in with technology pioneers such as Apple, Yahoo and Microsoft-each having focused on users with disabilities to make their products better for all. How will data drive lifecare/healthcare? A discussion about the need to share and collaborate with data, and how to derive meaningful outcomes. A fascinating study by USC CBC that collected and measured mind and body data from Marines in training. Outcomes from USC CBC’s pilot program with UnitedHealth, AARP and Lyft providing free rides and fitness trackers to monitor and improve seniors’ lives. An interview with Amy Morin, LCSW, the author of 13 Things Mentally Strong People Don’t Do about Mental Resilience. 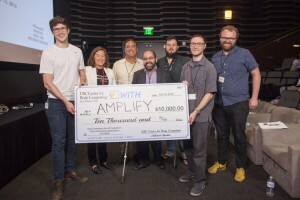 The highlight of the conference, of course, was the demo presentation by the winner of the WITH Foundation and USC CBC Voices for All Hackathon, Team Amplify. Continued engagement between the WITH Foundation and USC CBC’s broader network including large technology companies, such as Apple, Google, Amazon, and Facebook. The design and execution of a pilot survey study that will assess the opinions and perspectives of people with disabilities (PwD) on the PwD-user friendliness of wearable technology and other digital health tools. Data will be collected from a wide pool of individuals, making sure to include individuals with a range of cognitive disabilities, as well as from diverse living situations. The study will also investigate how differences in types of disabilities, which can include dexterity issues and differences in gait, could influence the choice of wearable sensors. The preliminary data will be used to apply for additional grant funding from other organizations and institutions to expand the research. The intent of publication of the study is to motivate the designers of wearable technology and digital health solutions to design with PwD populations in mind. Learn more about the USC Center for Body Computing here. Learn more out WITH’s Digital Health Initiative here. The mission of WITH Foundation is to promote comprehensive healthcare for adults with developmental disabilities that is designed to address their unique and fundamental needs.